Drafting of Wills, Trusts and Powers of Attorney. It is our goal to draft documents that are appropriate to your particular estate planning needs to ensure that your assets are managed and passed on according to your intent, without court interference, and in the most expeditious and tax advantageous manner. If you have a disabled family member, we can establish a Special Needs Trust to supplement their benefits. We will assess your particular situation and design an estate plan that will fit the requirements of your financial and family needs. In addition we prepare Advance Medical Directives to ensure that in the event you are unable to make a medical decision for yourself, a person that you designate will be able to act on your behalf without the necessity of court intervention for the appointment of a guardian. 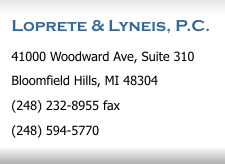 The Medical Power of Attorney is compliant with both Michigan law and the federal Health Insurance Portability and Accountability Act (HIPPA).